When it comes to our furry family members, most of us would do anything to make sure they receive proper care and love. From the moment we adopt them, our pets give us unconditional love. They bring joy and laughter to our families and truly become an irreplaceable part of our lives. Unfortunately, our pets get sick and injured just like us. And just like our medical bills, the cost of a veterinary visit or procedure can run at a high cost. It’s only reasonable that many pet-owners worry about whether or not they’d be able to cover medical bills should the time come. This is why many people consider pet insurance. However, it’s difficult to know whether pet insurance is actually worth the cost. Here are a few things to consider before opting for pet insurance. Before purchasing pet insurance of any kind, it’s important to know how it works. Much like your regular insurance, pet insurance has an array of premiums, co-pays, and deductibles. In some cases, pet insurance differs greatly in the fact that most people pay the bill themselves and are then reimbursed afterword. Moreover, factors like your pet’s age, the increasing cost of vets, and your dog’s breed, can all have an effect on how much your coverage costs. Make sure you thoroughly do your research beforehand, so that you understand just what you’re paying for. Along the lines of knowing how pet insurance works, is understanding what various plans cover and exclude. After all, it’ll only be a complete waste of money to you if you purchase insurance and then come to find out that your pet is excluded anyway. Some plans cover overall wellness care, like flea and tick treatments, vaccines, and yearly exams, since taking care of a pet is so important, people get the best care and even different food depending or the race of the dog, for example you can find yummy food that Pitbulls like online. Others include various illnesses, and some include auto-related injuries and accidents. Furthermore, plans can vary greatly depending upon your pet, so it’s important to clarify what exactly your policy includes. It’s also important to ensure that your pet doesn’t have anything that could exclude it from a policy. Many policies exclude hereditary conditions (and those based on breed), congenital conditions, or developmental issues. Lastly, be sure you check any age-related exclusions, as pets of a certain often go uncovered as well. If your pet falls into any of those categories, your plan essentially becomes worthless. Emergencies and the unexpected happen, but these life events also often cost you thousands of dollars that you might not always prepare for. Your pet’s health is the same way. However, depending on your pet and situation, pet insurance might not always be the best way to go. That being said, before opting to purchase any insurance, it might be worth considering setting up your own account or emergency fund for any pet-related costs. The key to this of course is ensuring that you add enough every month to build a solid nest egg for any major care. Another factor to consider is if your pet needs any type of expensive treatment at a younger age. In those cases, insuring yourself might not work. Nonetheless, there are many ways you could save up to make sure you can cover your pet’s medical bills that aren’t insurance. One of the best things you can do before purchasing anything is to add up the numbers to see if what you pay for pet insurance would actually be worth it, don’t forget that there are also other expenses, like the food, medicine, toys, even a dog crate would be useful. Review carefully what each policy covers and how much you’ll pay for it. Then consider how much various procedures and visits costs and how many times you might have to do that in a pet’s life. This can help you see if you’ll actually get back what you pay out. Carefully consider whether or not the policy has a pet maximum or cap. That too will affect how much you get out of your plan. If the numbers just don’t add up to you, that’s something to consider. However, no one can see the future. Plus, depending on the veterinary bill, some things could run you a hefty price. As you should anytime you make a large purchase, you need to carefully evaluate your situation and needs. Although self-insuring might work for some people who wouldn’t have a problem covering extra costs, not everyone has that luxury. Your pet’s treatments are not cheap and if you’re not in a place where you’d be able to pay, insurance could really save you. If you’re worried about your pet’s future and would be willing to pay $10,000 on a surgery, but don’t necessarily have the funds to do so, pet insurance just might be worth it. You also have to consider whether or not you can afford to wait for reimbursement. If you can’t afford to wait for the insurance company to pay you back, that’s an important factor to take into consideration. Overall, you have to decide if you can handle either the initial cost of insurance or whether or not you’d be able to pay out of pocket should something happen. 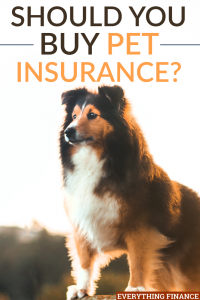 If you do decide that pet insurance would be a valuable investment, make sure you do plenty or research and shop around before purchasing any policy. Understand exactly what you’re getting, what they cover, their limits, and what you and your pet need in a policy. Evaluate a multitude of plans to ensure you’re getting the best deal possible for your money. At the end of the day, deciding whether or not pet insurance is for you really depends on a case-by-case basis. Your pet and financial situation play heavily into a policy’s worth over the years. Nonetheless, if you’re really worried about your pet’s health and how you’d pay any unexpected vet bills, pet insurance might be worth it. It will bring peace of mind. Have you purchased pet insurance? Have you found the cost to be worth the payout?